Take a kadai (wok) and heat oil. Add mustard seeds, cumin seeds and asofoetida. Add garlic paste and stir it for 2-3 times. Add fenugreek leaves and saute for about a minute. Add turmeric powder and 1 glass of water and cook it for about 5-7 minutes. Now add salt and red chilly powder. Add sugar if you like it. Take besan (gram flour) in a bowl and add some water to make a thick paste. 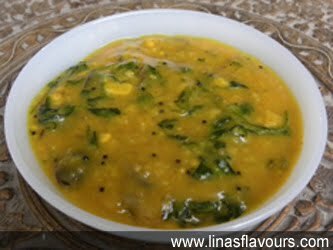 Add the paste in fenugreek and stir it continuously to avoid lumps. Close the lid and cook it for 5 minutes.